The purpose of the US campaign against the Islamic State is to provide grounds for the trillion dollar annual military budget Paul Craig Roberts, former Assistant Secretary of the Treasury during the Reagan administration, told RT. RT:The UK is also now on board the military operation against the Islamic State. Will a couple of strikes byTornado jetsmake any difference? Paul Craig Roberts: That is right, it will make no difference. The prospect for Washington prevailing against the Islamic State is no better than the prospect of prevailing against the Taliban. The purpose of these wars is to provide a reason for the trillion dollar annual budget of the military security complex. It is very difficult to have such massive expenditure without a cause, without a reason. So restoring the war in the Middle East is the reason. I think Washington had hoped to replace the Middle East in wars with a new Cold War with Russia. But Vladimir Putin said he was not going to participate. So I think that is why Washington is back to the Middle East. RT:The fear of the jihadists is getting bigger in the West. Is this a plan by America to keep its huge arms industry going? This is the reason, isn`t it? PCR: That is one of the most important reasons. There is another reason and that is the neoconservative ideology of American hegemony and the earlier neoconservative plan to cause turmoil throughout the Middle East and overturn even Saudi Arabia. So, all that may be a part of it. But we have been hearing these threats and fears now for the entire 21st century. Remember, “Saddam Hussein had weapons of mass destruction. It was going to be nuclear mushroom cloud over an American city.” We heard all sorts of lies about Gaddafi. RT: What does the IS want there? Does it want to draw away the US and UK allies? PCR: Yes, because what it does, it creates more support for the IS. We don’t really know, we can’t believe Washington, we can’t believe the Western media. In my opinion, these so-called jihadists are redrawing the artificial boundaries created by the French and British after World War I. And they are also trying to mobilize a fierce resistance to Western colonialism. RT:So should the US and the West let them get on with it? But how come, there was so much vested interest in the oil, etc? PCR: The question is: “What can the West and Washington do about it?” After 13 years they couldn’t defeat the Taliban, after the 8-year war in Iraq we now have the country dominated by the IS. After overthrowing Gaddafi we have total chaos. This Islamic State was created out of the forces at the CIA used to overthrow Gaddafi and sent to Syria to overthrow Assad. These are people who outfoxed their handlers. What can Washington do about it? Is it boots on the ground again? After 8 years it couldn’t occupy Baghdad? 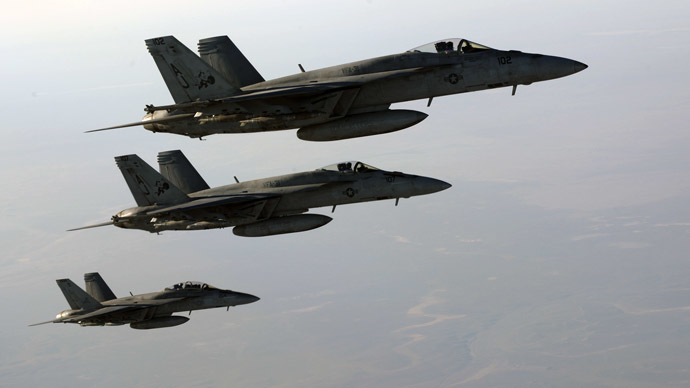 What is Washington going to do against the IS? RT:So what is your prognosis? Where do you personally think this is going to go? PCR: More expense, a way of justifying the military security budget, a way of keeping the American public afraid so they accept the police state at home. That is where it is going, the same place it has gone through the entirety of the 21st century. There is no change.